Lee and Donna Vance out to see every state in the union and experience local cultures where ever we can. 4 145-watt solar panels on the roof. 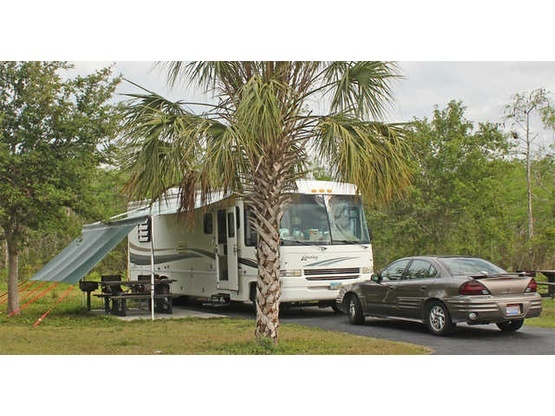 The decision to "hit the road" was not taken lightly, we've researched the options for several years and have worked our way through this dream lifestyle. The lifestyle was not foreign to us; we both grew up in families that had cottages on lakes, and loved camping. Donna's parents full-timed it for 22 years, until her dad died in 2009. We saw how they lived and admired their ability to travel. We even had a pop-up camper when our children were small and experienced great adventures in the Eastern half of the US. Now the kids are gone, and we want to see it all. Our goal is not to just see every state in the Union, but to experience them, taking our time to enjoy different walks of life. We will focus on nature and wildlife because we both love the peace and quiet. I think Hunting Island State Park, SC, showed us that - we first visited Hilton Head, SC and it was very nice, but commercial and crowded. When we saw the dolphins playing in the ocean at Hunting Island we fell in love. It's our roots, relaxing beside water and watching what God has put before us. Lee has been living with leukemia (CLL) since he was diagnosed in 2007. Chemotherapy that year put it into remission, but it returned in 2011. More chemotherapy was tried without success, and the decision was made to go ahead with a bone marrow transplant. In November of 2011, Lee spent a month in the James Cancer Hospital at Ohio State University in Columbus, where he underwent the transplant. This experience has taught us to grab every minute and enjoy life, which we do as we travel the land that we love. We now have a group on Facebook called RV Footloose. Look us up and see where we are! Lee was a machinist early in his career, worked mainly with plastics. His last 10 years of employment was with the local YMCA as their maintenance director. If you ask Donna she will tell you...he loves to tear things apart and fix them!! He's very handy around the home and now the motor home. Donna enjoys sewing and a variety of crafts. Donna sells her tote bags and handcrafted items any chance she gets...but won't push them on you! 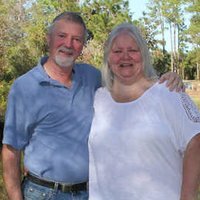 Lee and Donna both enjoy working on computers - we had a desktop publishing business out of our home and enjoy keeping in touch on facebook. We will share any knowledge we have - love others to enjoy using technology and not being afraid of it. So far we've boondocked (not counting WalMarts, truck stops, or rest areas) at Airventure in Osh Kosh, WI; Ocala National Forest, Albuquerque's balloon fiesta, and the Natchez Trace Parkway. During the winter of 2014-2015 we were fortunate to be able to experience Quartzsite and several BLM locations in Arizona and decided we like the desert as well. Englewood, Ohio (northwest suburb of Dayton, Ohio). Lee has lived in the Dayton area all his life (except when in the Air National Guard). Donna grew up in Endicott, NY, moved to the DC area, then out to the Dayton, Ohio area where she's lived for 43 years. We have a 2000 Georgie Boy Landau (Class A, gas), it's 33 feet with one slide on the drivers side. We tow a 2006 Jeep Liberty. We are RVFootloose and our rig is affectionately "Georgie". 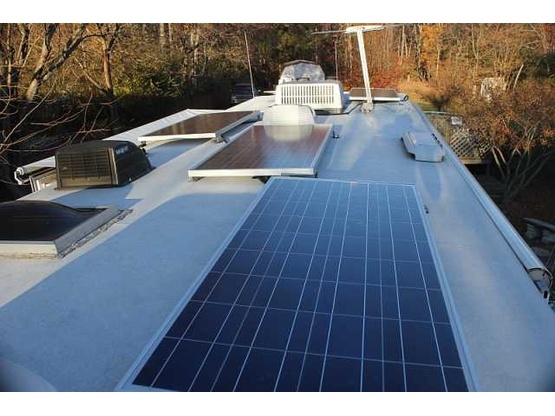 With 4 145-watt solar panels on top, and a 5th one that we can bring out and hook up, we can boondock just about anywhere the sun shines. We were happy to have Lee and Donna stay with us for a few days. We would love to have them back to visit any time.